Dominica real estate, short term properties for rent in Upper Goodwill, Dominica. 1 bedroom beautifully decorated vacation rental in Upper Goodwill. This recently built apartment is equipped with LCD cable tv, washer, microwave, linen, towels, etc. You'll enjoy relaxing in the beautiful garden directly outside this apartment. You'll enYouBring along a laptop and enjoy FREE wireless internet service. 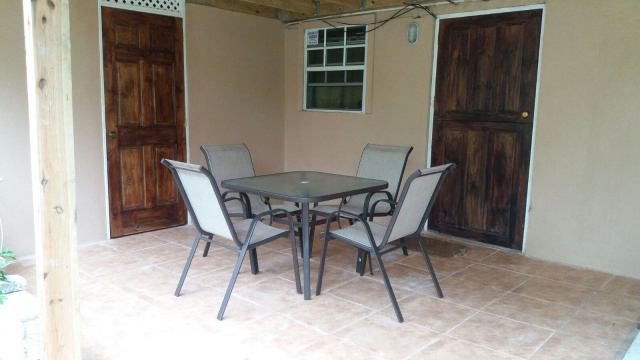 At this location you are within a 10 minute walk of the Princess Margaret Hospital and the capital city, Roseau. Perfect for the Business traveller or the leisure traveller who enjoys the convenience of being close to the city centre. THIS APARTMENT REMAINS COOL YEAR-ROUND. HOWEVER, THERE IS AN AIR-CONDITION UNIT IN THE BEDROOM FOR YOUR ADDED COMFORT. WHY BOOK A HOTEL ROOM OR GUESTHOUSE WHEN YOU COULD RENT THIS SPACIOUS ATTRACTIVELY FURNISHED 1 BEDROOM APARTMENT FOR A LOT LESS? 50% deposit required to reserve the villa with balance due on arrival. This private covered patio awaits you. Lovely garden surrounding tastefully furnished apartment.